Very powerful cleaner for cesspools and sewers that works on accumulated and solidified fats as well as sludge on the side walls of cesspools and pipes. Necessary for cleaning the waste water discharge points, by opening the pores of the walls of cesspools. In this way save money and avoid cesspool overflow, the unpleasant odors and the necessity for frequent evacuations that lead to additional expenses. 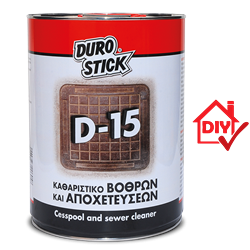 Apply it either through the piping system or directly to the cleanout of the cesspool. 600-800gr/m³, depending on the use.